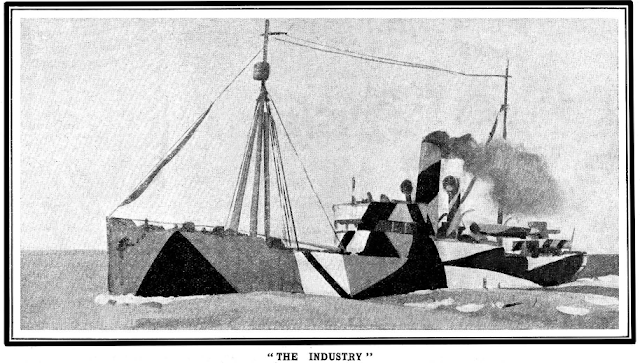 A Cora Josephine Gordon lecture in 1947: "Off the beaten Track in Europe"
Cora Josephine Gordon (1879-1950) continued to give public lectures and to write on art following the death of her husband Jan Gordon in 1944. 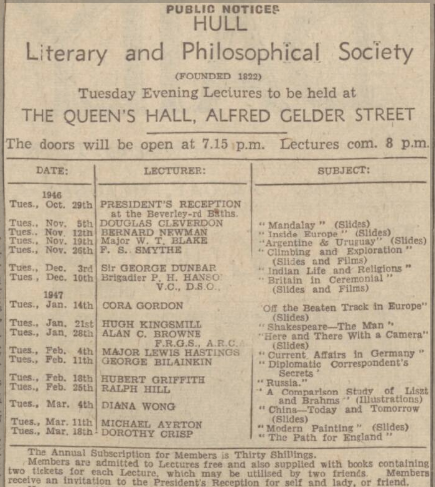 The Hull Daily Mail of October 4th 1946 carried a public notice detailing upcoming Tuesday talks at the Hull Literary and Philosophical Society, at the Queen's Hall. Cora Gordon's talk, "Off the beaten Track in Europe," is shown for Tuesday January 14th 1947. Before Jan Gordon's death, the couple had given public lectures together, often including musical performances. On their American journey in 1927 and 1928, they had given illustrated lectures under the management of William B. Feakins (Wm. B. Feakins, Inc., Times Building, New York). From 1931 onwards there are reports of lectures given by Cora alone, including the following. 1931. Sheffield; "I do know that Cora Gordon is going up to Sheffield at the end of the month to give two or more lectures about the travels which she and her husband have done together. Their books tell you a lot about these, but you have to hear them talk and play those wooden instruments from Albania to get the colour and fun of it all." 1937. "Vagabonds in Europe" in the Pump Room, Bath. "Cora Gordon, joint author of 'Misadventures with a Donkey in Spain,' and the 'Vagabond' series of travel books by Jan and Cora Gordon, will give an illustrated travel talk at the Pump Room, Bath, on Friday, Dec. 10th, at 5 p.m., entitled, 'Through Europe on Foot and Horseback.' Jan and Cora Gordon went abroad to paint pictures. Having little money and a strong desire to stay as long as possible, they went to a small town in Spain. 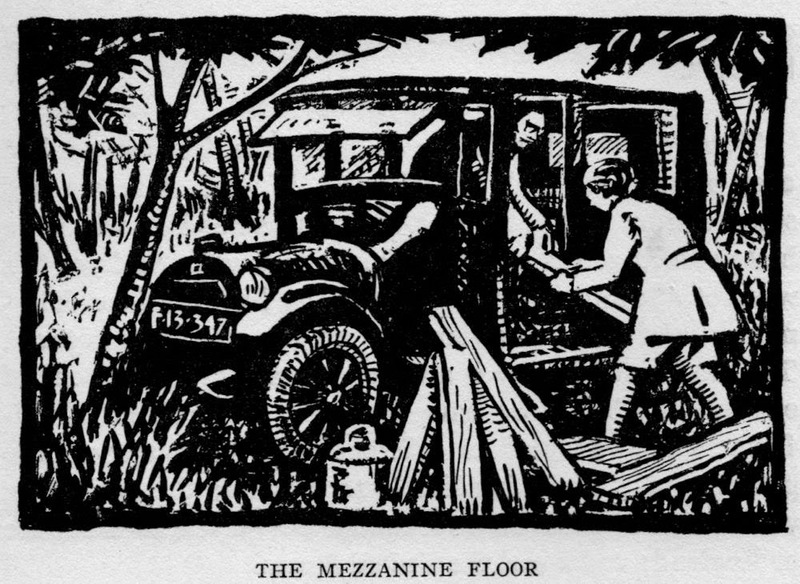 Their adventures were so unexpected and characteristic of the country that the book about these experiences, written and illustrated by themselves, 'Two Vagabonds in Spain,' was a great success. Having tasted the delights of living cheaply in one country, Jan and Cora went further afield, trying the Balkans, Lapland, Portugal, Hollywood and the Arran Isles. No matter where they went, amusing and characteristic adventures occurred, partly due to their occupation as painters and partly through their pursuit of folk music and poetry, which brought them into close contact with everyday people." January 18th 1940 on "Misadventures with a Donkey in Spain" at the Bishopsgate Institute, London. The original story was published in "Misadventures with a Donkey in Spain" (1924) and the story of a 2009 journey by descendants of the Godson of Jan Gordon is illustrated here. The last public lecture by Cora Josephine that I am aware of took place in Glasgow during March 1948. She died in July 1950 and links to her obituaries can be found here.